Samsung Connect Home: What is Samsung Connect Home? Samsung Connect Home - What is Samsung Connect Home? 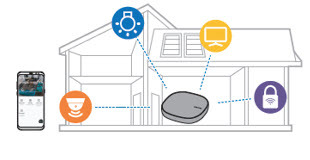 The Samsung Connect Home is an all-in-one device that combines a Wi-Fi router and a SmartThings Hub for an IoT usage environment. It provides wide networks coverage and fast internet speeds, as well as powerful Samsung security solutions. The device lets you conduct easy set-ups and make controls using a smartphone app. Thanks to its wide-ranging IoT-device connectivity, you can enjoy more convenient – and much smarter – network usage, no matter where you are. Samsung Connect Home: How to manage devices and locations? Samsung Connect Home -How is Samsung Connect different from the SmartThings app? Samsung Connect Home: How to control the registered devices?